Canadian Prime Minister Justin Trudeau said Sunday that President Donald Trump characterizing the country as a national security threat in imposing tariffs on its steel and aluminum imports was "quite frankly, insulting and unacceptable." "I'm having a lot of trouble getting around the idea that this entire thing is coming about because the president and the administration have decided that Canada and Canadian steel and aluminum is a national security threat to the United States," Trudeau told "Meet the Press" host Chuck Todd in an interview on NBC News. Trudeau will host the G-7 summit of world leaders in Quebec later this week. President Trump is scheduled to attend. "Our soldiers who had fought and died together on the beaches of World War II, on the mountains of Afghanistan and have stood shoulder-to-shoulder in some of the most difficult places in the world, that are always there for each other, somehow, this is insulting to that," he said. "The idea that the Canadian steel that's in military vehicles in the United States, the Canadian aluminum that makes your, your fighter jets is somehow now a threat. The Trump administration on Friday imposed duties of 25 percent on steel and 10 percent on aluminum imported from Canada, Mexico and the European Union. The White House followed through on President Trump's pledge in March to impose the tariffs after having earlier granted exemptions to various nations to try to buy time for negotiations. Trump said the tariffs were necessary to protect the U.S. from unfair competition and thereby bolster national security. 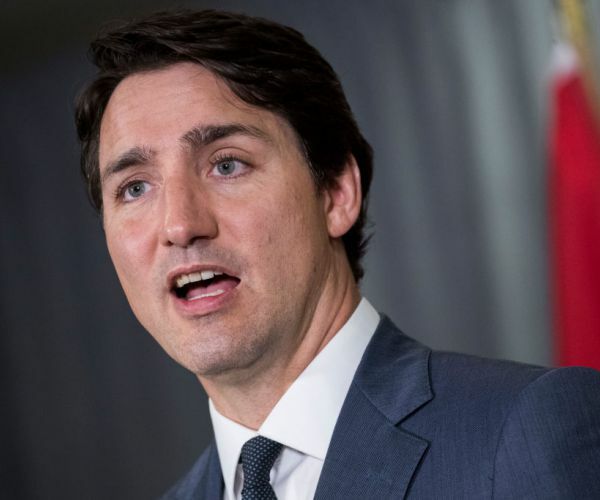 Trudeau called the tariffs "totally unacceptable" and responded with reciprocal fees on U.S. steel and aluminum, as well as other consumer products. "This is just going in the wrong direction," Trudeau told Todd, adding later that Trump's argument that "somehow, Canada is a national security threat to the United States simply doesn't hold water." "The measures he's taking right now are actually going to hurt American workers and hurt the very people who are looking to him to help them," the prime minister said. His country's duties on U.S. finished goods, Trudeau said, affects those "for which Canadians have easy alternatives. "Either made in Canada or made from another partner with no tariffs. "One of the truths about tariffs is they drive up costs for consumers," he added. "On top of that, these tariffs are going to be hurting American workers and Canadian workers." President Trump has also initiated talks on NAFTA. Trudeau expressed hope that a re-negotiated agreement can be reached, but said any five-year sunset clause was a "non-start." He said Friday that negotiations broke down over the sunset-clause demand from Vice President Mike Pence earlier in the week. "Our economies are incredibly interwoven, and there is an absolute path towards improving NAFTA and doing well on that," Trudeau told Todd. "I think they want a better deal on their auto sector from Mexico — and I think they want more access on certain agriculture products, like dairy, to Canada. "We're moving towards flexibility in those areas that I thought was very, very promising," he said. "But the United States want a sunset clause in NAFTA, which makes no sense. "You don't sign a trade deal that automatically expires every five years.